Writers are busy. In addition to brainstorming, outlining, plotting, and editing they must navigate and manage the Cyber world. This is no small feat and requires a few social media super heroes. Acronymizer: Seeks out definitions for acronyms, protecting writer from cyber stupidity. Blog Man: Delivers fresh blog material sure to captivate and entertain. Writes riveting error-free posts in a timely and visually appealing manner. CrowdSorcerer: Harnesses readers, friends, friends of friends, followers, thinkers, and movers & shakers with skills to solve all the writer’s problems. Comment Czar: Crafts savvy, witty, and pithy remarks that are NOT gender-political-race-religiously biased/ off-putting/ upsetting/ stupid. Pinterest Girl: Assesses photos on Pinterest, repins, comments, and seeks out fresh crowd-appealing images. Social Media Optimizer: (SMOer) Maximizes your content to target audience. Vets new platforms and investigates latest methods for making you a social media god. Jumps over slow Bandwagon and designs a rocket book-launcher. The Podcastinator: Creates, manage, records, and films audio and video content. Knows best lighting to minimize your flaws and exploit your fabulosity. Tag Boy: Blog Man’s sidekick. He includes the perfect keywords for your blog posts—catapulting your website into the glorious blogosphere where it will reap oodles of new reading stars. Master Threader: Manages all the comments on your blog and responds to every comment made on multiple social media platforms. Trolliac: Identifies trolls after their first comment and eradicates them from your feed. Does not engage. Webinar: Leaps over tall social media platforms in a single URL. Faster than a speeding key word. Soars above the others with brilliant, relevant, innovative information sure to garner gazillions of new followers. 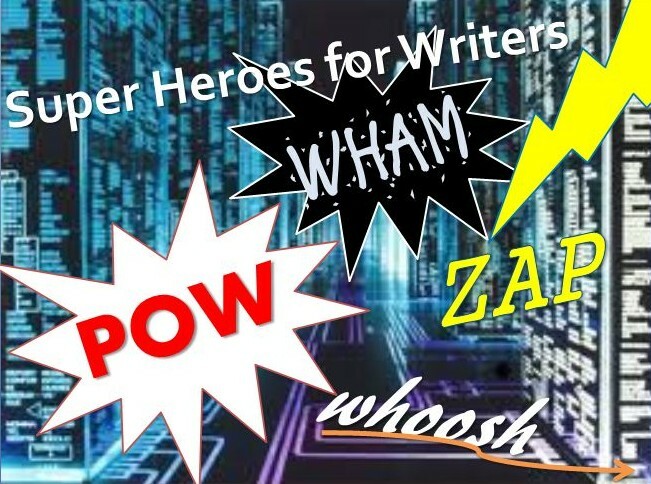 Note: A big thanks goes to author Avi Steinberg for the superhero idea! What sort of super social media hero would you like having? This entry was posted in Reading & Writing and tagged LZMarie, managing social media, social media, writing blog, writing life, writing tips on July 13, 2014 by lzadmin.